What’s the difference between Schwa (/ə/) and Wedge (/ʌ/)? 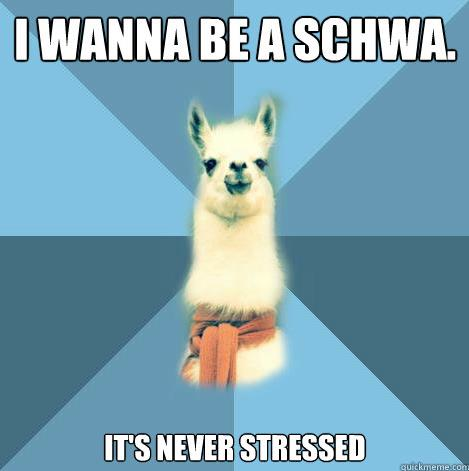 Today, I’d like to discuss a question which troubles many people when they’re first learning to use the International Phonetic Alphabet (IPA): What is the difference between the Schwa (/ə/) and Wedge/Carat/Caret (/ʌ/) symbols, and how can you tell which is which in transcription? For every other English vowel, we choose the proper symbol based on how the vowel sounds. The vowel in “look” sounds a lot like the vowel in “put” (/pʊt/), so it too must be an /ʊ/. The vowel in “free” sounds like the vowel in “me” (/mi/), so clearly, that’s an /i/ vowel. But what do you do with the vowel in “trust”, which sounds like both the “uh” in “cut” (/ʌ/) and the final “uh” in “sofa” (/ə/)? The very first step is to stop trying to hear a difference between /ə/ and /ʌ/. Acoustically, for speakers of General American English, there’s little to no difference between the two, and trying to listen to one will only bring you pain. In fact, /ə/ is a vowel unlike any other in the English vowel inventory. It’s not described (and differentiated from /ʌ/) phonetically, based on its sound or production, but instead, /ə/ is a phonological beast, arising from the sound structure of the word, the type of speech, and the speaker’s desire to minimize time spent on unimportant sounds. To examine this idea, let’s do a little experiment: Say the word “photograph” as slowly and carefully as you possibly can, paying attention to that middle vowel (before the “graph”). Some of you likely still pronounced the middle vowel as an “uh” (/ə/, giving you /ˈfoʊtəgɹæf/ or /ˈfoʊɾəgɹæf/), even when speaking very slowly and carefully. However, I bet there is a large number of you who drew out that middle vowel and said “foe-toe-graph” (/ˈfoʊtoʊgɹæf/) even though in actual speech, you’d be very unlikely to say it that way. Either way, you likely didn’t feel very confident about what that middle vowel was and how it was pronounced. The vowel in question here is a Schwa (/ˈfoʊɾəgɹæf/). Now a similar experiment: Say the word “fluctuate” as slowly and carefully as you possibly can, paying attention to that first vowel (before the “tuate”). So, somehow, the identity of that first vowel in “fluctuate” is beyond question, but the “proper” vowel in the middle of “photograph” is more open to interpretation, even though in connected speech they may sound the same. This ambiguity, one vowel which seems to be able to have two different identities, is why we need schwa. The difference between /ə/ and /ʌ/, at a fundamental level, is that /ə/ is a reduced vowel, whereas /ʌ/ is a full vowel. Vowel reduction is a phenomenon that happens around the world, according to different rules for each language, but the basic idea is that we simply don’t need to fully articulate which aren’t stressed in the word, so we do something there which requires less effort. Put differently, If we have a choice between fully articulating an unimportant vowel and just producing something which requires relatively little articulatory targeting but gets the job done, we’re going to take the easy way, and that easy way is /ə/. We don’t particularly care what each /ə/ sounds like, and as such, we just make something vaguely in the center of the mouth, sometimes a bit higher2, sometimes a bit lower. A schwa is a vowel that we produce just to have produced a vowel, the vowel we produce so we can move on to a part of the word which is more important to establishing and communicating the identity of the word. We make a /ə/ because we’ve got better things to do than pronounce the middle vowel in “photograph”. Compare this to /ʌ/. In words like “cut”, “nun”, “functional” or “sputter”, the “uh” vowels are full vowels, living in stressed syllables, and their identity is integral to the word itself. Fast speech, slow speech, really slow speech, that vowel is still just an “uh”. In General American English, there is simply no way to say the word “cut” without an /ʌ/ (still having it recognizable to listeners as “cut”). The /ʌ/ is absolutely essential to the word’s identity, whereas /ə/ is the surface result of a phonological phenomenon which reduces some vowels in unstressed syllables. That, right there, is the fundamental difference between these two sounds. It’s not the sound, but the origin of the sound. First, you have to find the stress in the word. The stressed syllable in a word is the syllable which is most emphasized and least reduced. Think of the sentence “the musician wants to record a record”. In the act of recording (re-CORD), the second syllable is stressed, whereas in “REcord” (the physical item), the first syllable is stressed. Here, the primary difference is stress, and the vowels in the unstressed syllable of each are reduced. Every word has at least one primary stress (which we mark in the IPA using /ˈ/), and finding it is relatively easy once you get the hang of it. We know that every word has a stressed syllable, so for a monosyllabic word (a word with only one syllable), we know that the only syllable has to be stressed. For multisyllabic words, you have more options. One easy way to find the stress of a multisyllabic (containing more than one syllable) word is to try every possible stress pattern. Let’s take the word “mahogany” (/məhɑgəni/). First, put the stress on the first syllable, really emphasizing it, “MAhogany”. Then try the second, “maHOGany”, then “mahogAny”, then finally “mahogaNY”. Only stressing the second syllable (/məˈhɑgəni/) sounds acceptable, everything else sounds strange or somehow “wrong”, so we know that the primary stress is on the second syllable. Once you’ve figured out where the stress is, figuring out whether the vowel is /ə/ or /ʌ/ is easy. In English, vowel reduction only occurs in unstressed syllables. So, if your “uh” sound is occurring in a stressed syllable, it can’t be a reduced vowel, so it’s /ʌ/. If your “uh” sound is in an unstressed syllable, it’s likely a result of vowel reduction, so it’s a /ə/. So far, we’ve been talking about this at the word level, but if you pay attention to connected speech, you’ll notice that lots of vowels (and sometimes whole words) get reduced to schwa, even if they’re just one syllable. These words tend to be grammatical words rather than content words, words like “the”, “a”, “of”, and “to”. These words (and some others) get reduced because they’re very easily predictable, and frankly, we don’t want to take the time to fully articulate them. These reduced grammatical words can be a little bit confusing for people who are thinking about the “stressed/unstressed” idea above. They’re single syllables and thus, the only syllable is stressed. However, compared to the rest of the vowels in the sentence, the “uh” vowels in them are definitely reduced, and thus, they’re definitely /ə/. In General American English, we have two rhotic vowels, /ɜ˞/ and /ə˞/ (“right hook reversed epsilon” and “schwar”). /ɜ˞/ is found in words like “word” (/wɜ˞d/), “birch” (/bɜ˞tʃ/), “squirrel” (/skwɜ˞l̩/), or “merchant” (/ˈmɜ˞tʃn̩t/), whereas the /ə˞/ is found in words like “butter” (/ˈbʌɾə˞/), “later” (/leɪɾə˞/), or “scatter” (/skæɾə˞/). Both of these vowels sound like “er”, and again, like /ə/ and /ʌ/, they can’t be distinguished by sound. The beautiful thing about the /ɜ˞/ vs. /ə˞/ distinction is that it’s exactly the same as the /ə/ vs. /ʌ/ distinction. In stressed syllables, an “er” vowel is going to be /ɜ˞/, whereas in unstressed syllables, you get /ə˞/. By learning to differentiate /ə/ vs. /ʌ/, you’ve also learned to differentiate their rhotic counterparts, /ɜ˞/ and /ə˞/. Wondə˞ful! Of course, this post is primarily discussing General American English. Although schwa around the world is generally an unstressed and reduced vowel, the rules for vowel reduction vary in different languages (and dialects! ), and other languages have different established transcription conventions where some of the above may not apply. I just figured this information might be useful for the many English-speaking people just being introduced to the IPA and trying to figure out why they can’t hear this one contrast.